A writer’s website: Thorkild Borup _ Mathias Vestergaard Corp. The idea of designing a website for a writer was a new challenge for me. 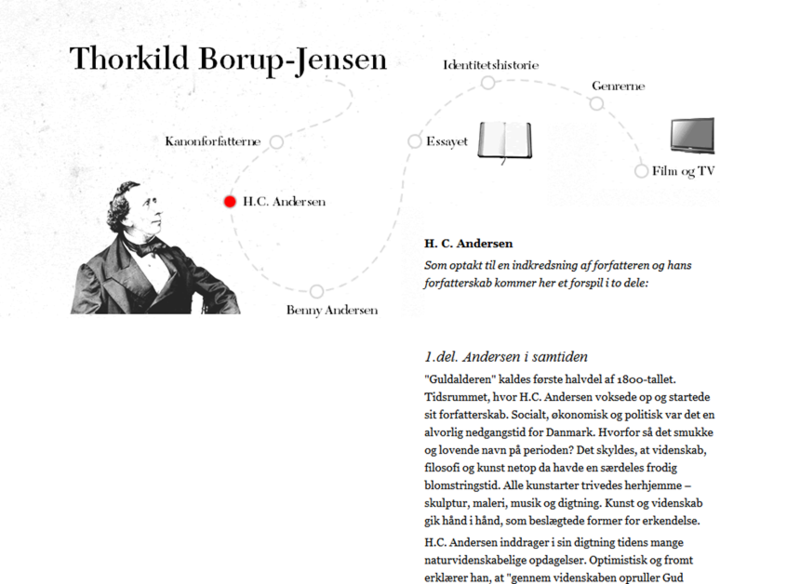 Thorkild Borup has written several books about famous Danish authors including H. C. Andersen, Benny Andersen, Ludvig Holberg and Tom Kristensen. Therefore, he needed a simple website where the main focus would be on the text/words and he showed me a couple of examples from other websites. I decided to keep the website sober, using black and white, with only a few highlights in red, and almost no graphic elements, except for a few illustrations. I wanted the lettering to look like a book so I used the Georgia font for the main text. I however still wanted the site to be just a little more dynamic, therefore I chose to incorporate the New Caledonia font in the main headings. The subtle effect to the site can be described as a subtle feel of old paper, implemented by the positioning of a watermark in the upper-left corner. In order to facilitate the editing-process of the content, I designed a very simple CMS back-end.